The Fun Farm & Corn Maze is now closed for the season. See you in September of 2019 for more fall fun! Be prepared to get lost on a fantastic adventure. 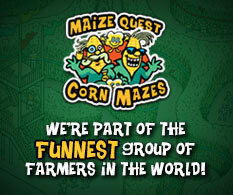 Inside our 4-Acre Giant Maize Quest® Corn Maze, you will find twisting pathways, questions and answers, and picture rubbings. It's a maze, it's a game, it's educational, and it's FUN! Enjoy this year's maze theme - Racing Pigs! As you navigate your way through the pathways of our maze, you'll find pictures, clues, and games to make this learning process FUN! 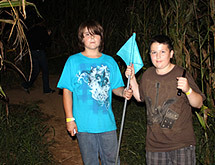 Be sure to visit us at night for Flashlight Nights - a totally unique experience in the maze on select nights! Come try our maze in the dark for a different twist - but be sure to bring a flashlight in case you "get lost!" Flashlights are also available for purchase. 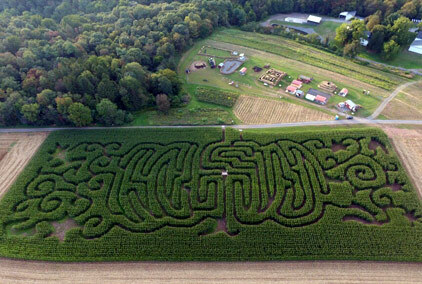 2017 - Last year's maze theme was "the Great Pumpkin"
2016 - Last year's maze theme celebrated farming in America! 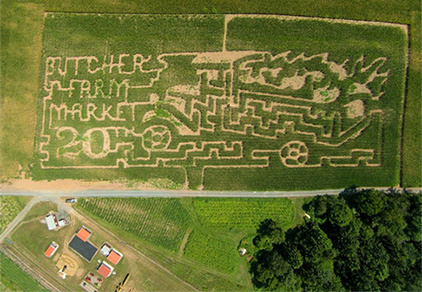 2015 - The 2015 maze theme was "Butcher's Farm Market 20th" - celebrating our 20th year in business! 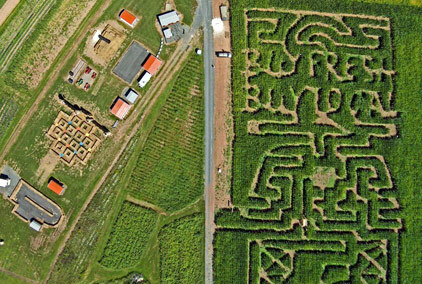 2014 - The 2014 maze theme was "Buy Fresh. Buy Local." featuring a barn, tractor, sun-ripened tomatoes, and more. 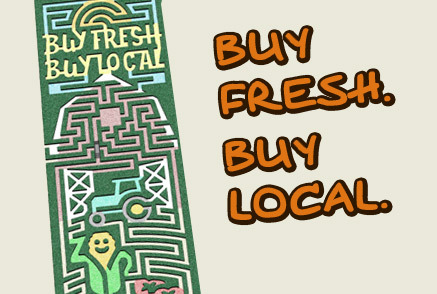 There's nothing that compares to buying farm-fresh, local produce! 2013 - "Fun on the Farm" featuring a turkey driving a tractor and wagon.